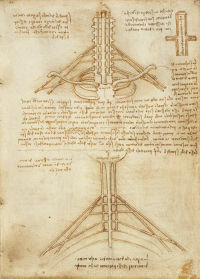 Not only did Leonardo investigate the human body through anatomical dissection. He also created inner bodily mechanisms that perfectly fulfilled their function. This drawing illustrates Leonardo’s understanding of the nervous system as comprised of a network of nerves between the neck and the arm. In the upper drawing, cervical vertebrae are “sawn through” to reveal a central and two lateral nerve cords. In the lower drawing the bones are removed, leaving the nerves and the base of the brain exposed. According to Leonardo, impulses are transmitted through a cavity in the brain that contains “animal spirits”. Cords carry these “animal spirits” down the spine through a tree of tubular nerves into the peripheral regions of the body to the limbs, commanding the movement of muscles and sinews. The same spirits convey the sense of touch back to the ventricles for processing in the sensus communis, the part of the brain where all the nerves converge. While “animal spirits” pass up and down the lateral canals of the spinal chord, the central chord is reserved for the transmission of “generative power” to the reproductive organs. The nerve branches with their muscles serve the nerve chords as soldiers serve their officers, and the nerve chords serve the ‘sensus communis’ as the officers serve their captain, and the sensus communis serves the soul as the captain serves his lord. Prior to his extensive investigation of the human body through anatomical dissection, Leonardo created inner bodily mechanisms that perfectly fulfilled their functions, such as the neurological system illustrated in this schematized diagram of the network of nerves between the neck and the arm. In the upper drawing, cervical vertebrae are “sawn through” to reveal a central and two lateral nerve cords. In the lower drawing the bones are removed, leaving the nerves and the base of the brain exposed.